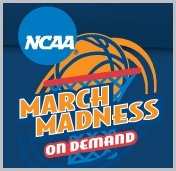 An exciting feature of this year's NCAA March Madness on Demand (MMOD) is the availability of highlight clips during the games themselves. This near-real time metadata tagging and indexing capability is being powered by Digitalsmiths, and it represents a key milestone in the online sports experience. As I described last month in my review of MLB.com's "Fantasy Baseball Commissioner" product which this season will include in-game highlights as well, these initiatives move metadata tagging and indexing from the realm of on-demand libraries to live streams. Digitalsmiths' GM Patrick Donovan wrote a post about this last Thursday, and I got a chance to catch up with him about it further. Speaking of sports, here's how big a deal live streaming of March Madness on Demand (MMOD) has become for the NCAA and its TV partners CBS and Turner Sports: yesterday, which was the tournament's big kickoff, the parties ran a pricey full-page, rich media takeover ad on the NYTimes.com home page (see below). MMOD has developed into the highest-profile live online video sporting event of the year. It's hard to believe any real college hoops fan doesn't know about MMOD's availability, but with the NYTimes ad, clearly the parties weren't taking any chances. Speaking of sports, Turner Sports, CBS Sports and the NCAA announced this week that March Madness on Demand will be back online and free to users yet again. MMOD is by far the highest-profile sports event offered live online and the NCAA and networks just keep on improving it every year. For the 2011 tournament, the big new drawing card will be an iPad app, along with new features like personalized channel lineups, social interaction and live stats updates. This morning Encoding.com is announcing support for multi-bit rate encoding and "stream segmenting," to let its customers comply with Apple's HTTP streaming spec for delivering video in iPhone and iPad apps. Last week, Encoding.com's president Jeff Malkin explained to me that several of its customers had reported that video apps they had submitted to Apple for approval in the App Store had been rejected because they didn't offer multiple bit rates. A post last week on TechCrunch provided more background on Apple's requirements. Encoding.com now offers its customers 3 pre-set encoding rates with additional ones configurable on demand. Subsequent to encoding and splitting the video into multiple segments, Encoding.com packages up the files and delivers them with XML to the specified CDN for HTTP streaming from standard web servers. The goal of multiple bit rates is to let the video adjust to varying available bandwidth, which in turn helps smooth the user's experience. Jeff reported that CarDomain, the largest auto enthusiast site, is now using Encoding.com's multi-bit rate. CarDomain had seen its app rejected by Apple repeatedly due to "bandwidth usage limitations." The backdrop here is that with more and more apps incorporating video, when WiFi isn't available, AT&T's 3G network comes under ever-increasing pressure. Just last week I posted on the sub-par experience several iPhone users I've surveyed have been having when trying to access the premium iPhone March Madness app on AT&T's 3G network (though to be fair a few others commented that their access has been ok). I had been surprised that Apple and AT&T felt confident enough in the latter's 3G network to approve this app in the first place, given the likely concurrence of viewing. AT&T is obviously feeling more confident in its network - or at least in the buffer that Apple is creating by enforcing the multi-bit rate requirement - that more video-intensive apps seem to be passing through the approval process. In addition to the MMOD app, other examples include the new SlingPlayer app, announced last month, and Justin.tv's video app, which was unveiled last week. AT&T is likely trying to be more aggressive with these video apps as news continues to filter out that its iPhone exclusive will expire this year, opening up competition from other carriers. Mobile video adoption is still well behind online, but the proliferation of mobile devices and apps that support video will no doubt accelerate usage. The next big device catalyst will of course be the iPad, coming this weekend. And as more ecosystem partners like Encoding.com provide the underlying tools to deliver seamless mobile video experiences, even more video-centric apps can be expected. Two weeks ago I noted that the premium "March Madness on Demand" iPhone app, which allows live streaming of all MMOD games would be a big test for AT&T's 3G network, which has been repeatedly criticized for lack of capacity. Based on reports I've received from several friends who have been using the app both on AT&T's 3G network and on WiFi, it appears that AT&T is indeed falling short, with video quality highly inconsistent or video just plain unavailable (see iPhone screen grab below). Granted it's a small sample size, but they've tried it repeatedly and the pattern is pretty clear. AT&T's network should come under further pressure as the field narrows and audience sizes surge. On a positive note, one friend took note of how incredibly cool it was to be eating lunch at Panera Bread watching live hoops on his iPhone (note, he was on their WiFi at the time). Mobile video is definitely here. On the flip side, I've watched a fair amount of various games online and I have to say I've been somewhat unimpressed by the quality of the streams. Last night's Cornell game (my alma mater) was a perfect example - full screen was highly pixilated and plain unwatchable. Even in standard size there were many stalls and the stream couldn't keep up with camera switches during fast-break coverage. What have your experiences been like? Post a comment now (no sign-in required). College hoops bragging rights won't be the only thing on the line when the NCAA March Madness men's basketball tournament kicks off next week. Also under the microscope will the performance of AT&T's 3G network, since CBS Mobile announced earlier this week that its new $9.99 premium iPhone app will offer live streaming of all the tournament's games over AT&T's 3G, EDGE and Wi-Fi networks. As with last year there will also be a free "lite" app that will offer on-demand clips only. Presumably AT&T, CBS and NCAA have modeled how many concurrent streams could be requested under different penetration rates for the app and feel comfortable with AT&T's ability to support these in a quality manner. Let's hope for their sake they got the math right. I continue to hear iPhone users expressing frustration with dropped calls and 3G availability, particularly in Manhattan (in fact I've resisted getting an iPhone for this very reason). AT&T does seem to be getting more confident in its 3G coverage though; just last month it approved Sling's SlingPlayer app for use on its 3G network. In that case, I thought that because few people would likely buy the $29.99 app the stakes weren't that high for AT&T. 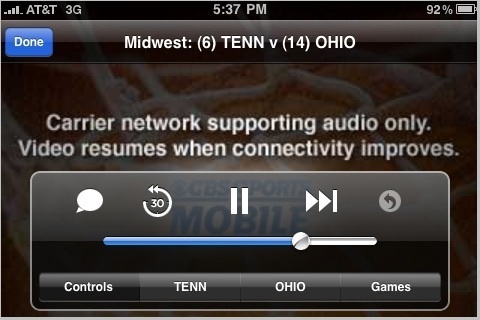 MMOD is a different story; if AT&T's 3G network fails there will be a horde of angry hoops fans banging on its doors.